Dr. Green and his colleagues reviewed the records of 101 patients who had shoulder pain lasting at least six weeks and that had not resulted from trauma, like a fall. Forty-three arrived bearing M.R.I.’s from a doctor who had seen them previously. The others did not have scans. In all cases, Dr. Green made a diagnosis on the basis of a physical exam, a history, and regular X-rays. A year later, Dr. Green re-assessed the patients. There was no difference in the outcome of the treatment of the two groups of patients despite his knowledge of the findings on the scans. M.R.I.’s, he said, are not needed for the initial evaluation and treatment of many whose shoulder pain does not result from an actual injury to the shoulder. Now this isn’t a randomized controlled trial, and I could pick apart the methodology if someone wanted to make grand pronouncements based on the results. But let’s accept that this study shows it’s possible to treat patients equally well in this situation with or without an MRI. Dr. DiGiovanni did a similar study with foot and ankle patients, looking back at 221 consecutive patients over a three-month period, 201 of whom did not have fractures. More than 15 percent arrived with M.R.I.’s obtained by doctors they had seen before coming to Dr. DiGiovanni. Nearly 90 percent of those scans were unnecessary and half had interpretations that either made no difference to the patient’s diagnosis or were at odds with the diagnosis. 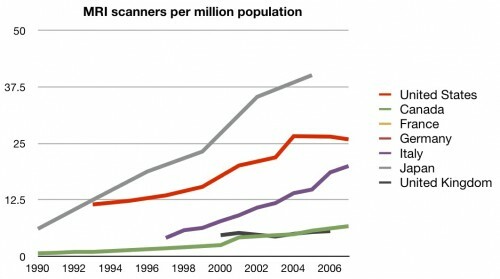 Part of the problem is that so many of these MRIs are just unnecessary. Some doctors get them because that’s how they were trained. Some get them because they think patients want them and see them as part of “quality” care. Some doctors get them because they think it will protect them from getting sued. Dr. James Andrews, a widely known sports medicine orthopedist in Gulf Breeze, Fla., wanted to test his suspicion that M.R.I.’s, the scans given to almost every injured athlete or casual exerciser, might be a bit misleading. So he scanned the shoulders of 31 perfectly healthy professional baseball pitchers. The pitchers were not injured and had no pain. But the M.R.I.’s found abnormal shoulder cartilage in 90 percent of them and abnormal rotator cuff tendons in 87 percent. Remember that these are top athletes, who have some of the best functioning shoulders in the world. Almost 9 in 10 of them have abnormal MRIs. As Dr. Andrews remarks, “If you want an excuse to operate on a pitcher’s throwing shoulder, just get an M.R.I.” Do you think these pitchers would benefit from surgery? Do you think it would have been good for them to get MRIs in their doctors’ offices? So here in the US we’ve got a test that’s over-utilized, over-charged, and that likely leads to large numbers of false-positives, requiring even more expense and likely increased harm. But the MRI is just one example of a huge problem that encompasses the overuse of all kinds of technology and screening here. It’s one we’re still denying, and one that we will need to confront if we have any hope of improving our health care system. Pricing of MRIs has always puzzled me. The machines cost a lot, but once it’s paid for, the variable costs per patient are pretty low. The cheapest thing is to have relatively few machines that run more or less non-stop. But we have lots and lots of underutilized MRI scanners. They make such beautiful pictures, Ansel Adams-esque images of grey toned anatomy. The first time I saw what an expensive MRI could make by way of a picture, I thought, why would anybody ever want to look at anything else? 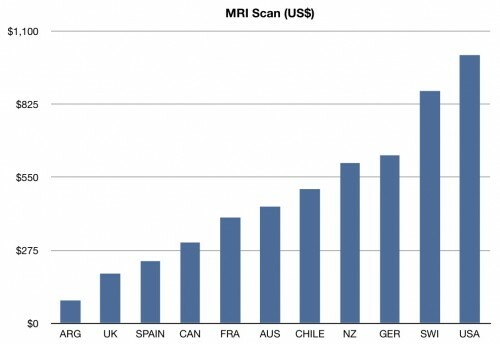 I wonder how much of the Canadian MRI equipment “deficit” is attributable to the US “surplus”. When we lived in Toronto in the 1980s it was common for people to be sent to the US (at OHIP cost) for specialized services that were locally overbooked. Obviously this was a (probably small) cost containment measure. How much could US medical costs be reduced by more effective resource sharing? Unnecessary, expensive MRIs that lead to the “therapeutic cascade,” the downstream treatments that result from an image that shows an abnormality, are the poster child for the larger epidemic of many different forms of imaging in U.S. healthcare. Physicians think seeing is believing, patients think an MRI or CT is a sign they’re getting good care, and hospitals walk to the bank with all the money they’re raking in. The only bright spot in all of this is that Medicare and other payers have caught on and they’re starting to put some downward pressure on providers. When I published Overtreated in 2007, the estimate for the number of CT scans that would be done annually by 2010 was 100 million. 100 million! That’s one for every third man woman and child in the U.S. Between 2007 and now, the rate of increase has slowed somewhat, so we’re not quite at 100 million CTs. But we still do far too many imaging tests. Several years ago I went to a shoulder surgeon, MRI in hand. He confirmed the previous diagnosis with the usual examination and X-rays, and glanced at the MRIs, saying that they added little. About three years later I went back to the same surgeon for the other shoulder. This time an MRI was immediately ordered, which was conveniently down the hall. I don’t know if the community standard of care indicated that a MRI should be done at some point, or if my symptoms differed, or if a profit motive (perhaps unconsciously) was involved. I refrained from asking him, since discretion seemed prudent when talking to a man who would be cutting on me soon, and he was known to be the the best shoulder guy in the area. I would love to see further discussion of research into decremental cost effectiveness, that is, procedures, medications, or approaches that yield close to the same effectiveness as “gold standard” treatment but at substantially lower cost. Are there leaders in this type of research? What incentives can move this forward, or are we perpetually doomed to chasing tiny improvements at massive new cost? In my experience 90%+ of lumbar spine MRIs are not helpful in treating low back pain. if you miss that 1 in 1000 mass you are totally screwed. So off to MRI they go.